Nation's largest high school journalism program uses Adobe® Creative Suite® 5.5 Master Collection to cultivate the next generation of award-winning print, broadcast, and web journalists. Palo Alto High School (Paly) is surrounded by a rich legacy of excellence. Situated in the shadows of the esteemed Stanford University, adjacent to the innovation of Silicon Valley, and just a short trip to the cultural diversity of the San Francisco metropolitan area, the school has ample influence for developing inventive approaches to student learning and academic achievement. 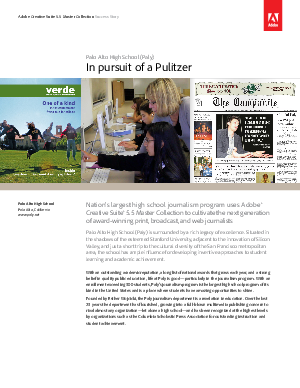 With an outstanding academic reputation, a long list of national awards that grows each year, and a strong belief in quality public education, life at Paly is good-particularly in the journalism program. With an enrollment exceeding 500 students, Paly's journalism program is the largest high school program of its kind in the United States and is a place where students have amazing opportunities to shine. Founded by Esther Wojcicki, the Paly journalism department is a revelation in education. Over the last 25 years the department has flourished, growing into a full-blown multimedia publishing concern to rival almost any organization-let alone a high school-and has been recognized at the highest levels by organizations such as the Columbia Scholastic Press Association for outstanding instruction and student achievement. Wojcicki is passionate about the impact journalism has on student achievement, noting that students in her program develop transferable life skills such as professional-level writing, research, and analytical capabilities that are essential for 21st-century learning. Several studies, including one published by the University of Oregon, support Wojcicki's vision, concluding that students engaged in journalism programs surpass the performance of non-journalism students on standardized tests in as many as seventeen areas of scholastic achievement. As a strong advocate of providing career- and life-advancing skills, Wojcicki bases Paly's journalism program on the philosophy that students learn by doing, not by watching. But she believes that these skills and experiences are not limited to just journalism students and has begun a new initiative, www.21stcenturylit.org, that aims to use the power of modern technologies-social media platforms, blogs, video, and other interactive mediums-to enhance learning for students in other disciplines.